I pack my lunch everyday. My husband just read that and frantically waved his BS flag. OK. My husband packs my lunch everyday. It's true. He's a saint. On the rare occasions that I eat at work, I'm lucky enough to work at a place with a wonderful cafeteria. 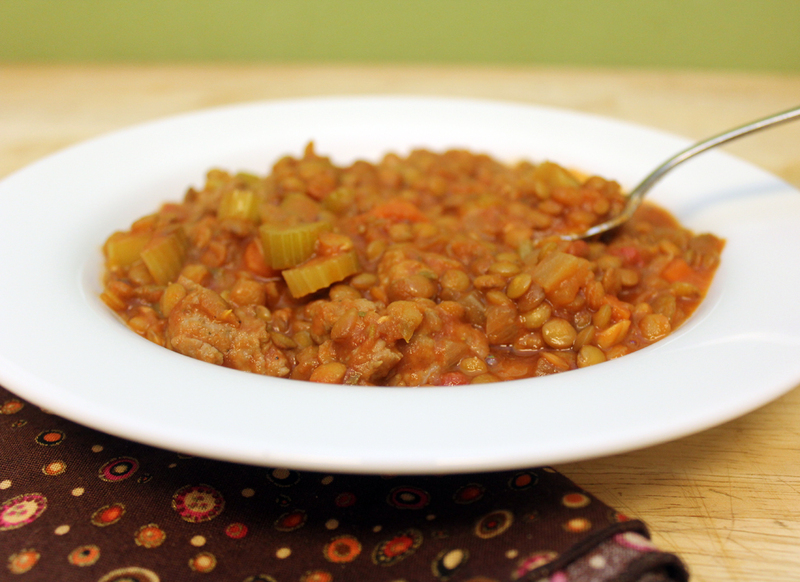 I recently had a spicy sausage and lentil soup that I really wanted to recreate. Sometimes, when the stars align and the moon is in the seventh house, I cook ahead on the weekends and make my saint-husband's life a little easier. Last weekend was such a weekend. 1/3 pound sausage - I used mild Italian sausage. Adjust the red pepper flakes if you use spicy sausage. Saute onion, celery and carrots in 2 tablespoons of butter. Cook until vegetables start to get tender - about 5 minutes. Add in sausage and cook until browned all over. Add in garlic and red pepper flakes and cook 2 more minutes. Add the bay leaf and cook another 2 minutes. Add broth, stir to scrape up all of the browned bits from the bottom of the pan. Stir in lentils, tomatoes and tomato paste. Bring to a soft boil and then reduce to a low simmer. Simmer for an hour. Test lentils and veggies. If they are soft enough for your tastes, you're done! If they are still a little firm, add another cup of broth and continue to simmer for another 15 minutes. Test again. This is a really thick soup. 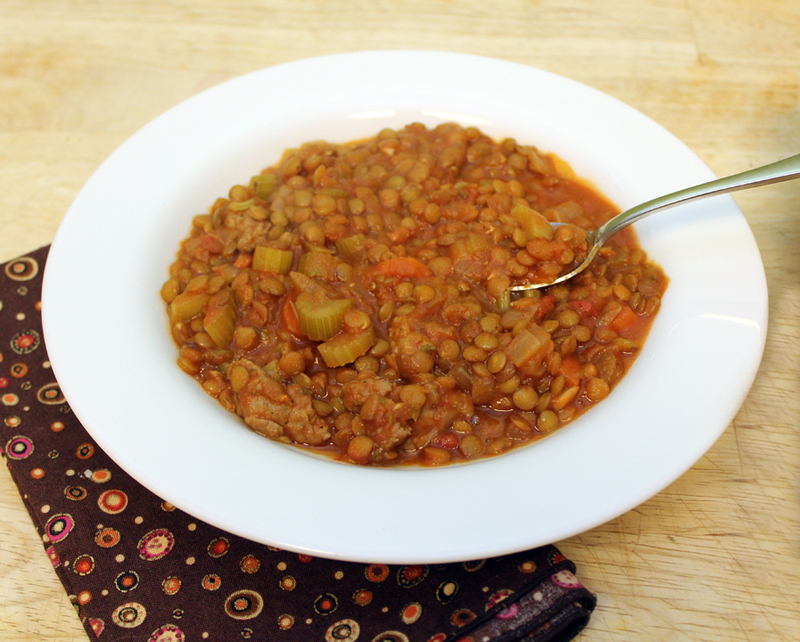 If you want it thinner and soupier, just add more broth as you cook the lentils. I used only a tiny bit of meat - just to add flavor and the occasional bite of meat. This reheats really well! It made great lunches for a whole week. As you may know, this blog is written by two friends - one in Portland, OR and one in NYC. Antoinette and her husband are doing OK in the wake of Sandy and are home safely. We both send our thoughts and prayers out to those affected by the Sandy storm.